For years, you've been going to arcades and carnivals, trading quarters for the chance to grab toys and candy with a motorized claw. Now you have the chance to play these games directly on your phone while winning many attractive prizes in the same time as well. Finding the right claw machine game that offers you to win big and real gifts can be hard and because of that we decided to help. We discovered one incredible real-time claw game for all of you. Let’s see what the claw game offers you. 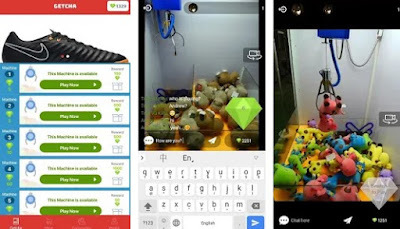 This is one highly fun and addictive real-time claw machine game that is developed on android platform as a game that offers players to win big each time just by catching and earning GETCHA diamonds. On the game players have their chance to win many attractive gifts with collecting their diamonds and exchanging them in the shop. Players are also offered to engage with players from the whole world to share, reuse, resell or give their items for free to any player they like. With this platform players will be able to share the love and give out to anyone in need. GETCHA has to offer users amazing features that will get them addicted to playing on their first try. Players just need to use the keypad displayed on their phone to control the claw machine while catching GETCHA diamonds. On the game users will be able to enjoy 2 Camera views that allow better understanding on the distance on target and the red laser points to the target for their catch. With collecting the diamonds, users have the chance to exchange them for many attractive gifts available in the shop with even free shipping offered worldwide. Players can engage with each other on a live chat, sharing diamonds, reselling their items, reusing items or giving items to anyone they like for free. More than just playing and winning, players are also offered to become sellers and earn even more diamonds. The diamonds can be shared with others for winning even more, or sharing them and shopping with them for gifts in the GETCHA shop. Just exchange diamonds for the favorite gift. Download this game for free now on Google Play to join the fun and engage with players worldwide!